In my guest room I want to create a warm cozy feeling, something that would reflect how we feel about our guests. There's nothing like feeling loved! 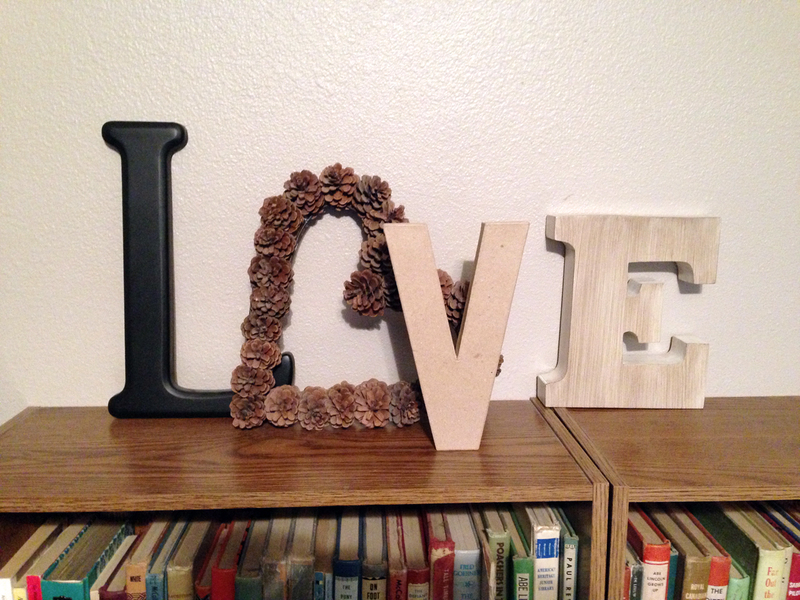 The "V" - from Hobby Lobby, $2.00 after using a 40% off coupon. The heart shaped pine cone wreath is an old piece of decor that's been floating around here for years. 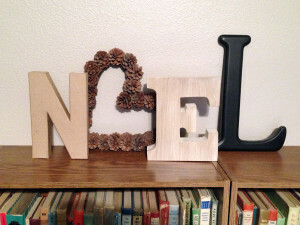 I want to paint one or more of the letters, but have not decided what colors to paint them. What do you think? 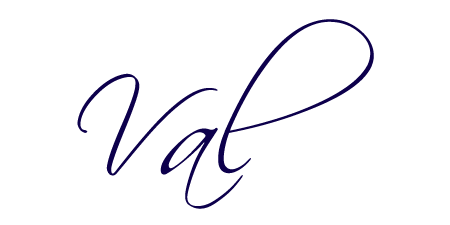 I am going back and forth with color choices because I want to use some of the same letters to change it up at Christmas time to say NOEL. The room is a hodgepodge of navy (bedspread) and forest green (not by my choice) so I don't want to conflict with those colors. I eventually will change out the outdated forest green carpet, but for now I'm stuck with it. (UPDATE: we now have lush, brown carpet!) Any suggestions on colors? 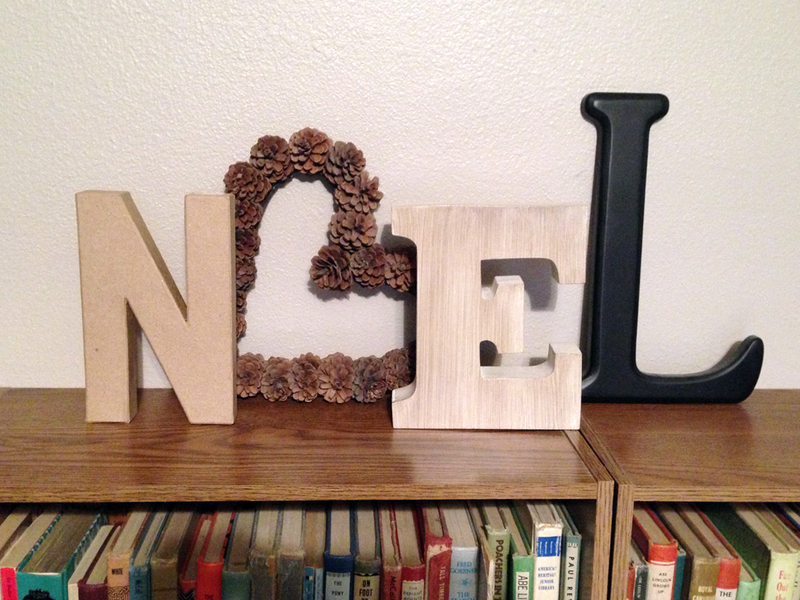 I could paint the "N" a forest green since it's a Christmas letter and wouldn't be used in my LOVE. Maybe use white for the "E"? Here is another word, "EAT" I used in my kitchen. 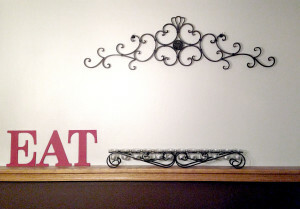 The wood letters and scrollwork are from Hobby Lobby and were on sale for 50% off. The candle holder is from Good Will - $3.00. 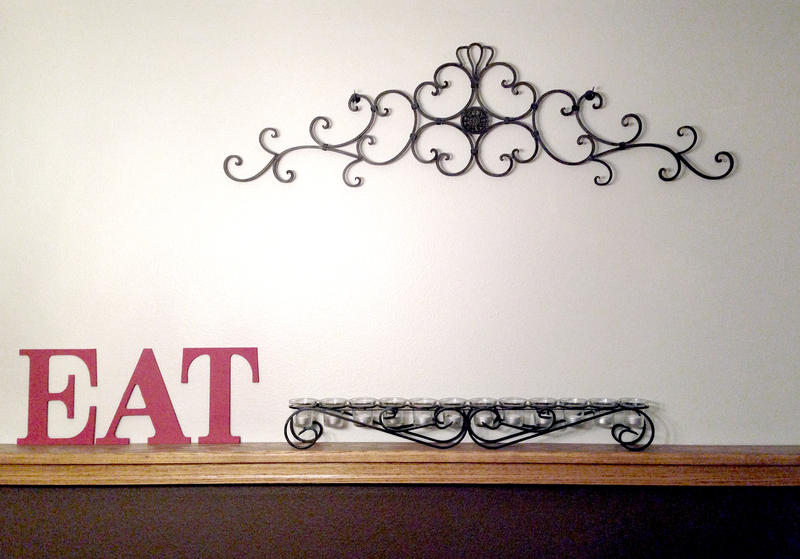 I painted the letters red to match my other accents in my kitchen. Before and after pictures of my kitchen will be posted after I put up the pictures, the last thing I need to do to finish my kitchen. (DONE! See our kitchen here.). 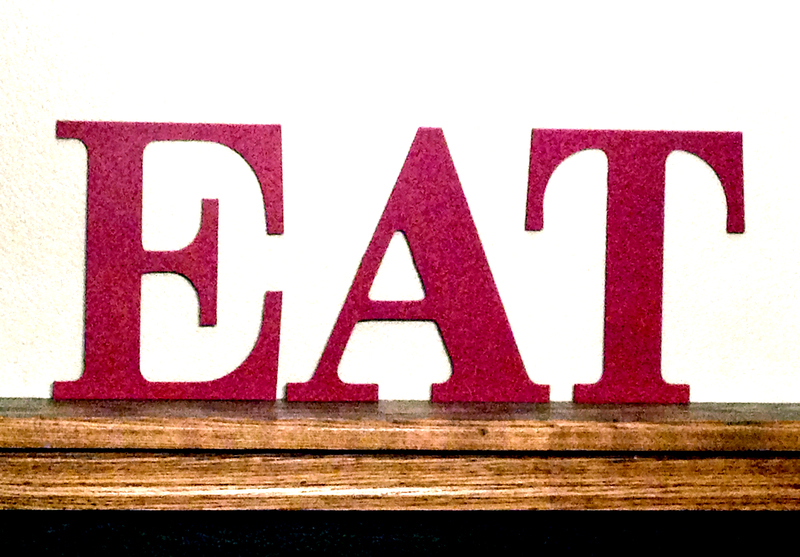 When my son visits, he rearranges the letters - so far he's done TEA, ATE and ETA. I leave it alone till the next time he visits! 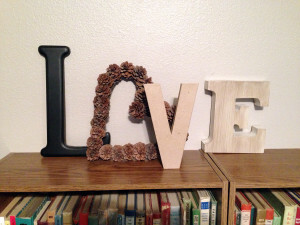 I like the "Love" display. Consider russet and sage for the letters. They'll go with the carpet for the nonce, and won't overwhelm the heart wreath, which is a lovely muted color. You'll still be in the green and red camps for the "noel". I think the white would be pretty stark, judging from the pictures–in fact, I'd redo the black "L" in a dark brown. But then, I love natural colors, all the autumn and wood tones. It feels more restful. I agree about not using white – too stark for sure, and think the "L" ought to be dk brown as well. I like you, prefer the neutral/natural colors. I do like russet and sage. Or maybe even use two shades of either. I guess I can give it a try and always repaint if I dont like it.